Questions for Students (and others): Which of these gangsters were you already familiar with? What other notorious gangsters from this period should we add to the list? Was Prohibition a mistake? Have you seen any of the numerous movies made about these über criminals? Back in Elementary School we actually sang a song about this guy! (A Woody Guthrie song.) That makes him pretty famous in our minds, and Charles Arthur Floyd blazed a trail of bank robberies across the Midwest and Central States from 1922 until his death at the age of 30 in 1934. This infamous criminal was one of the most active of the famous gangsters, with numerous robberies and shootouts on his resume. Floyd was a crook from the start, first arrested at the age of 18 and sent to prison for 5 years for a payroll robbery in 1925. Paroled after only 3 ½ years, Floyd said he would never again be taken alive. He got his nickname not from his good looks, but because when he did honest work in the oilfields he dressed in dress pants and a white button up shirt. His youthful looks also resulted in being described by a robbery victim as “a boy.” Floyd detested the Pretty Boy moniker. (Too bad for you, Pretty Boy!) As Floyd traveled the states stealing what he could, he was arrested a few times on minor charges, using an alias to avoid building up a case against himself. When he was arrested in 1930 in Toledo for an Akron bank robbery in which he killed a police officer, Floyd (who apparently broke his vow to never go to prison again) went to prison for 12 to 15 years, but soon escaped to continue his trail of robberies and several murders, including a police officer in Bowling Green, Ohio and a Federal Agent in Missouri. Robberies and murders continued, with a killing of an Oklahoma Sheriff in 1932. Seen as a “Robin Hood” type character by some of the public, it was rumored that Floyd and his gang burned up mortgage papers when they robbed banks, something they may or may not have done, but rumor alone was enough to make them popular with homeowners! Another 4 police officers were killed by the Floyd gang in 1933, a shootout known as the “Kansas City massacre,” an ambush of police that were transporting a criminal allied with Vern Miller of the Floyd criminal universe. Along with officers, the prisoner that was to be rescued also died in the shootout, and Vern Miller was found dead a few months later, beaten and strangled, possibly for messing up the “rescue” in Kansas City or for other offenses against various criminals. Floyd’s participation in the Kansas City Massacre is debatable. Upon the demise of John Dillinger, Floyd became “Public Enemy #1” and was hotly pursued by the FBI and other law enforcement agencies desperate to stop the killing of police officers. On October 22, 1934, Floyd was spotted in a car outside of East Liverpool, Ohio by famous FBI agent Melvin Purvis in another car with 3 other FBI agents. A car filled with 4 East Liverpool Police officers was also on hand as a gunfight broke out, with various descriptions of the course of events. While accounts of the shootout vary, the FBI attempted to take all the credit for the takedown and killing of Floyd, a typical publicity seeking maneuver by the FBI in those days. The East Liverpool officers claimed one of their number had downed Floyd with non-mortal wounds (intentionally so as to capture him), but Purvis allegedly ordered another FBI Agent to kill Floyd as he lay helpless, a stream of bullets from a Tommy Gun doing the deed. Known as “Scarface,” like other gangsters Alphonse Capone did not tolerate use of this nickname in his presence. During Prohibition Capone was the underworld King of Chicago, leading a crime organization that raked in millions of dollars per year. 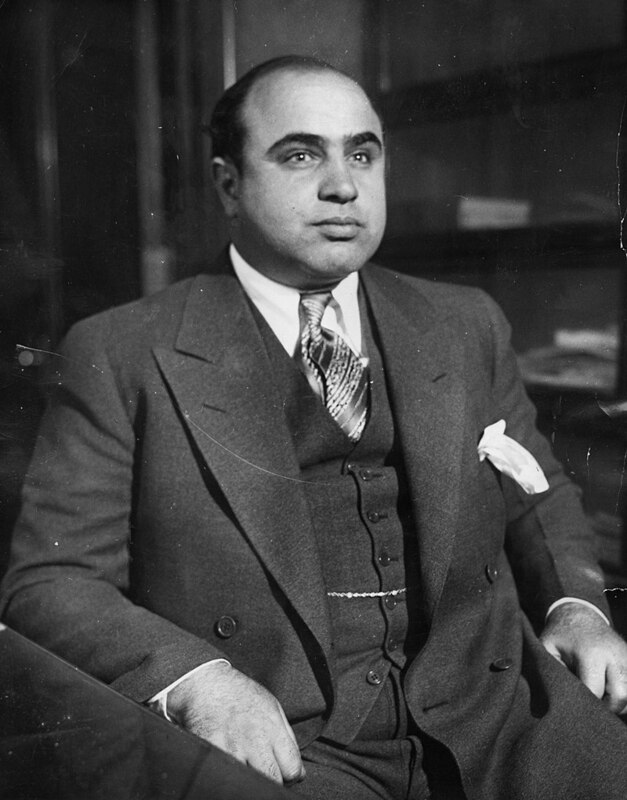 Not without enemies among criminals, Capone is credited with engineering the St. Valentine’s Day Massacre of 7 of his rivals from the North Side Gang in 1929. While Capone’s gang made their millions, law enforcement was helpless to convict him of a crime as Capone had underlings doing his “dirty work.” Capone successfully beat minor raps and special attention from his arch nemesis, Federal Agent Eliott Ness and his “Untouchables,” until an enterprising prosecutor hit on the idea of going after Capone on tax evasion charges. While not able to prove Capone’s income was from criminal enterprises, the prosecutor (Assistant Attorney General Mabel Walker Willebrandt) easily used Capone’s lavish spending as proof that he had much more income than Capone reported on his income tax returns. Thus, in 1932, at the age of 33, Al Capone’s leadership of the Chicago Mob ended with an 11 year Federal prison sentence. Capone was not liked by other prisoners, other than his previous cohorts, and suffered hatred and even a stabbing at one point. Capone’s brain was addled by degenerative syphilis and by 1939 he was paroled after spending a year in the Alcatraz prison hospital, living the remainder of his life in Florida where he was said to have the mental capacity of a 12 year old. He died in 1947 of pneumonia after suffering a stroke a few days earlier. Dillinger is notable for not having a fancy nickname like many of the other infamous gangsters, except for being known as “Public Enemy #1” by the FBI. Infamous for bank robberies and high speed automobile pursuits, Dillinger sent a letter to Henry Ford thanking Ford for the Ford V-8 engine that made his getaways possible! Dillinger was bad seed, enlisting in the US Navy but deserting, earning himself a dishonorable discharge. Dillinger went to prison in 1924 for robbery and assault, and was released in 1933, having served 9 ½ years of his 10 to 20 year sentence. Dillinger immediately began his string of bank robbers, getting arrested in Ohio and sent to a county jail. There he helped others to escape, gaining their alliance in forming a criminal gang. The escaped men returned to “extradite” Dillinger,” a ruse in which they pretended to be Indiana State Police officers. Dillinger was sprung from jail, and an officer was killed in the escape. During Dillinger’s career of crime, he is believed to have killed only 1 person, a police officer in East Chicago, Indiana, though he was never convicted of the murder. Dillinger is said to have shot the officer who shot Dillinger first, striking the bullet proof vest Dillinger was wearing. Leaving a trail of at least 12 banks robbed between 1933 and 1934 (for a career total of about 24 banks), Dillinger traveled the country evading police and becoming famous. 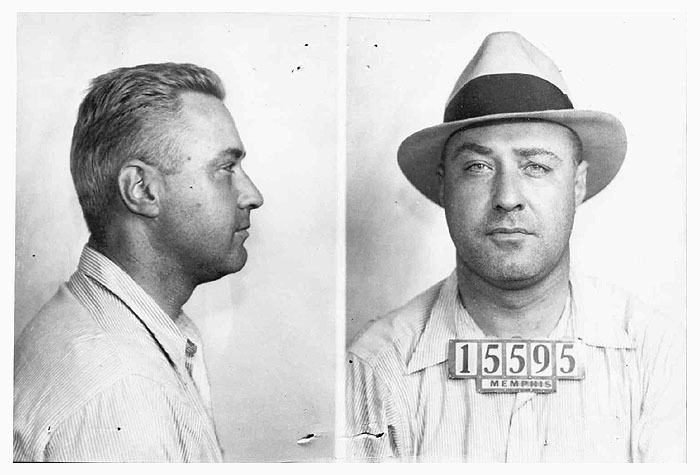 Arrested in Tucson, Arizona in January of 1934, the local Sheriff boasted about the high level of security that would prevent Dillinger from escaping. Of course, Dillinger escaped in March of 1934, either with a gun smuggled into the jail or by fashioning a fake gun as Dillinger claimed. The robbery spree continued, including shootouts and narrow escapes. The FBI became obsessed with catching this most famous of robbers, spurring Dillinger to seek plastic surgery to change his appearance, which he underwent in May of 1934. The surgeon denied changing Dillinger’s fingerprints as is often reported. The surgery done in the home of the doctor instead of a hospital almost killed Dillinger, when the surgeon applied too much ether as an anesthetic. Federal Agents got wind of Dillinger’s whereabouts, and staked him out when Dillinger went to a movie at the Biograph Theater in Chicago on July 22, 1934. Two groups of agents were deployed to arrest Dillinger when he came out of the theater, effectively ambushing the robber. Again, as is usual, accounts of the takedown vary, with Dillinger either reaching in his pocket for gun, drawing the gun, or just being gunned down. Dillinger was hit with 4 bullets, 2 of which only grazed the infamous gangster. Another bullet caused a non-mortal wound in Dillinger’s side, while the fatal shot entered the back of Dillinger’s neck, passing through his spinal cord and brain, before exiting below Dillinger’s right eye. Dillinger was quite obviously dead on the scene, though he was taken to a hospital where he was declared dead officially. Probably 6 shots were fired by 3 FBI Agents as Dillinger apparently tried to duck into an alley. No other people were shot. Blazing a trail of crime from 1932 to 1934, the couple and their gang had robbed about 12 banks, many stores and gas stations and had killed 9 police officers and a handful of civilians in the process. Both of these career criminals were born in Texas, and they died together (of course) in Louisiana. During their crime spree, Clyde’s use of a Browning Automatic Rifle (BAR), a .30 caliber one-man machine gun turned the tide of battle in a couple of shootouts with police, and the gun became his trademark. Bonnie had been arrested for robbery at one point but was released weeks later for lack of indictment. On another occasion, the police (who do learn from mistakes) were armed with a BAR and machine guns when they attempted to ambush the pair in November of 1933. 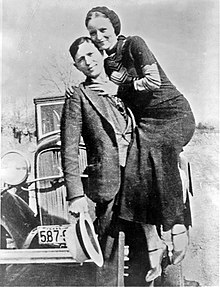 Although Bonnie and Clyde escaped, both were wounded in the legs as they drove away. Clyde planned and executed a prison breakout for some of his gang members and other prisoners in Texas in January of 1934, and this insult to Texas law enforcement seemed to precipitate a renewed eagerness to catch or kill the criminal pair. Killing more highway patrolmen contributed to the enthusiasm for the blood of Bonnie and Clyde, and public opinion swung decidedly against them as newspapers published false and embellished accounts of Bonnie’s supposed bloodthirstiness. Fate caught up to the murderous duo on a country road in Louisiana on May 23, 1934 as 6 officers (4 from Texas, 2 from Louisiana) set up an ambush and blasted the pair when they rolled up in a stolen car. About 130 rounds were fired by the cops, with at least 25 hitting Bonnie and Clyde apiece. Of course, they died right there and without any medical attention. Lester Joseph Gillis 1935 mugshot #5437. Actually named Lester Joseph Gillis, Nelson used the nom de guerre of George Nelson. His youthful appearance and slight stature earned his nickname of “Baby Face,” but he was anything but a baby. Like many other high profile criminals with a famous nickname, Nelson would not tolerate being called Baby Face in person. Born in Chicago in 1908, this ruthless robber and murderer only made it to age 25 before being gunned down by the FBI in Barrington, Wisconsin in 1934. Though Nelson’s career was short, he kept busy at flamboyant crimes of robbery and shootouts while trying to escape. An associate of John Dillinger and his gang, Nelson may also have been acquainted with Pretty Boy Floyd. Nelson is another of the gangsters that wore a bullet proof vest to good effect, once being shot by a police officer without major injury. In the November 27, 1934 gunfight that cost Nelson his life, a running car chase and gunfight ended up at a cross roads when the Agents and robbers exited their vehicles to do battle. Nelson was hit with a .45 caliber bullet that went through his liver and pancreas, a mortal wound. While wounded he exchanged firearms with a gang member, Nelson receiving a semi-automatic .351 Winchester rifle that had been modified to fire on full automatic. The mortally wounded Nelson stoically advanced on the FBI Agents, effective firing his weapon and striking an agent twice. Nelson was hit with buckshot in the legs, and when he got up continued his assault on the law, killing another agent. Nelson and his wife fled in a car they loaded with weaponry from the shootout scene, and their companion followed in a stolen FBI car. Hit by 8 buckshot pellets and a single bullet from a Tommy Gun, Nelson soon died of his wounds. 7. Ma Barker, Fred Barker, Alvin Karpis. The Barker Gang, also known as the Barker-Karpis Gang, terrorized the Central United States from 1931 to 1935. Founded by Fred Barker and Alvin Karpis, Kate “Ma” Barker (nee Clark) was allegedly the brains behind the gang that at times numbered as many as 25 crooks. Ma Barker, sometimes called Arizona Barker (or simply “Arrie”) was born in Missouri in 1873, a place and time when the name of Jesse James was a popular folk hero. Her sons, born around the turn of the century, were little criminals right off the bat, the eldest son, Herman, running over a child in a 1910 robbery get away. Kate died in a shootout with police in 1935 along with her son, Fred. Herman died in 1927 after a botched robbery in which he shot a police dead in the mouth. Herman shot himself to avoid capture. In 1928, the 3 surviving Barker boys were all in prison at the same time. In 1931, Fred Barker teamed up with his prison mate, Alvin Karpis to form a gang of robbers that proceeded to commit crimes at a furious pace. Never hesitating to use deadly force, the Barker-Karpis Gang was a dangerous outfit that became famous with their brazen robberies and ruthless execution. During the 4 year crime spree, the gang decided Kate’s common-law husband was a security risk, and murdered the big mouth guy. Ma Barker did not get along with the girlfriends of the gang’s core members, so to the extent possible her boys kept Ma hidden away in hotels and places away from the gang. Her involvement as the “brains” of the outfit may well have been merely mythical. A $200,000 score on a ransom from a kidnapping saw son Arthur travel to Chicago where he planned on laundering the ransom money. When son Arthur was arrested, the police found out the hideout of Fred and Ma from a map showing the remote Florida hideout, and moved in on the wanted felons. Karpis and other gang members were away from the house, leaving only Fred and Ma to face the police in one last gun battle. Fred’s dead body bore numerous bullet holes, but Ma was shot (fatally) only once. Conflicting reports say a Tommy Gun was found in Ma’s lifeless hands, while other reports say the machine gun lay between the 2 dead criminals. 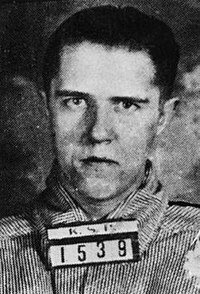 Alvin “Creepy” Karpis, born in Montreal, Quebec, Canada in 1907, became Public Enemy #1 with the deaths of the Barkers. Unlike the Barkers, Karpis managed to live a long life, dying in Spain at the age of 72 in 1979, his death possibly caused by an overdose of sleeping pills. He had been captured and jailed in 1936, finally being released in 1969. On his release from prison, Karpis was deported to Canada. 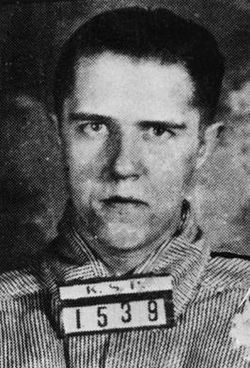 Karpis, probably unlike John Dillinger, actually did have surgery to remove his fingerprints. After prison Karpis released his memoirs in 1971, and a second set of memoirs was published a year after his death. Arthur Barker died in 1939 in a failed escape attempt from Alcatraz, shot to death by a prison guard. Hazelgrove, William. Al Capone and the 1933 World’s Fair: The End of the Gangster Era in Chicago. Rowman & Littlefield Publishers, 2017. Helmer, William and Rick Mattix. The Complete Public Enemy Almanac: New Facts and Features on the People, Places, and Events of the Gangsters and Outlaw Era, 1920-1940. Cumberland House Publishing, 2007. The featured image in this list, Charles Arthur “Pretty Boy” Floyd, from the FBI files, is a work of a Federal Bureau of Investigation employee, taken or made as part of that person’s official duties. As a work of the U.S. federal government, the image is in the public domain in the United States. Previous ArticleOctober 21, 1096: The First Crusade Was Not the First Crusade!